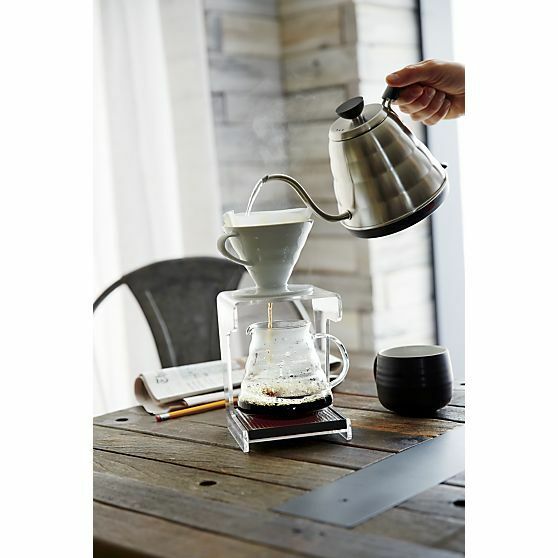 The Hario V60 Coffee Dripper is one of the most popular manual brewers in the specialty coffee field today, found in many brew bars around the country. The design of this pour-over has ridges along it’s innards and a single large hole at the bottom which allows the coffee to extract evenly from the vessel. Part of insuring that you get an excellent brew from the V60 is the pour technique, you must slowly and steadily coax the extraction of the brew from the grounds. V60 filters are known for being thinner than other pour-over filters which makes them contribute little paper taste to the final brew … but you should, as always, pre-rinse your paper filters to minimize the inevitable paper taste. Now to the good stuff … how to use one! 16:1 SCAA Standard = approximately 1oz (28g) coffee per 16oz (453g) water. 1.6 – 2.0 grams of coffee per fluid ounce of water; if you don’t have a scale, use 2 table spoons of coffee per 6 fluid ounces of water. Start water boiling, then allow to cool during the next steps. Weigh proper coffee amount for size of finished cup. Place paper filter into the V60. Pre-rinse the paper filter with some of your hot water to avoid a papery taste in the final coffee brew and pre-heat the finished cup. Without removing the filter (to maintain contact integrity), dispose of pre-rinse water. Grind the pre-weighed coffee and add it to the filter. Create a small divot in the center of the grounds. Starting your pour inside the divot, use the cooled water (optimal 200 degrees) to completely saturate the grounds and allow the coffee to bloom for about 30-40 seconds. Using a continuous circular motion, slowly pour water over the grounds, using the sides of the V60 and pouring into the middle. Stop pouring the water when you’ve reached about 1 inch below the top of the finished cup and allow to continue dripping. Discard the filter/grounds and enjoy your V60 drip coffee. For greater consistency, use a weight scale and stop pouring the water at the recommended weight for the size of your finished cup. The whole brew time from bloom to finish should take approximately 3.5-4 minutes when done correctly. You can substitute a metal cone filter for the paper filters, but still pre-heat the filter and finished cup. Hario V60 Pour Over by Matt Perger from St Ali on Vimeo.